Solution: Owning to the popularity of Galaxy SIII, Samsung Company has zoomed to the top global mobile phone provider. One of the reasons that make Samsung Galaxy S3 so fantastic is that it is the most wonderful phone for on-the-move video enjoyment. But the limited video formats supported make Samsung Galaxy S3 impossible to play all videos. In the case, you'd better search for a reliable Galaxy S3 video converter to get video converted to Samsung Galaxy readable formats. Prior to the video to Galaxy S3 conversion, let's have a look at this media player supported audio/video format. Have a bevy of video files saved in AVI, MKV, MPG, MOV, FLV, 3GP, AVCHD etc on your Mac computer? Feel desperate for a professional video converter for Samsung Galaxy S3 to transfer all kinds of videos to this media player? 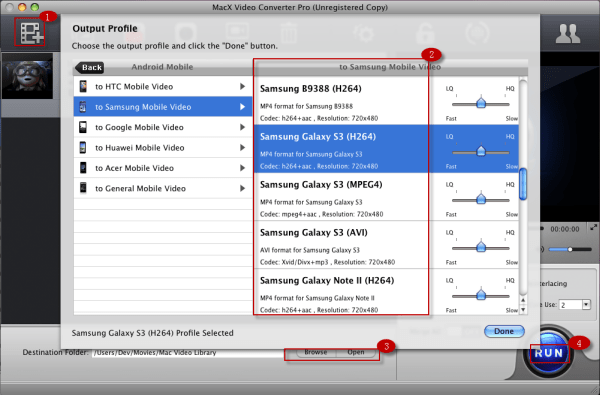 Here, you can convert and play videos on your Samsung Galaxy S3 with MacX Video Converter Pro. As a standard-bearer in the field of video conversion, this Galaxy S3 video converter program provides you a more fantastic digital experience with your Samsung Galaxy S3 device since it supports converting WMV, FLV, MOV, AVI, MKV, MP4, M2TS, etc. videos to Samsung Galaxy S3 playable format on Mac running system. The specialty of this best video converter for Galaxy S3 is the built-in profiles made for each type of Samsung gadgets, making it stand out among other similar software at present. After free downloading and installing this video converter for Samsung Galaxy S3 on Mac, click "Add" button to import source video. If you want to play video on Samsung Galaxy S3, please select "to Android" and you can find the specific output format. Tips: this Samsung Galaxy S3 Video Converter application features more funtions as YouTube downloading, video editing, etc. You can also download YouTube video to Samsung Galaxy recognized format for offline playback. Hit the "RUN" button to start to convert video to Samsung Galaxy S3. You can view the conversion progress and cancel the converting process at anytime. This powerful Galaxy S3 Video Converter for Mac also features the unique ability to convert Multi-track HD videos M2TS, MKV, AVCHD, HDTV BDAV and MPEG-TS video movies, offering users the most convenient way to play no matter 720p or 1080p HD video on Galaxy S3. What's more, you can also choose to convert YouTube video to iPhone 5 or transfer MKV to iPad as you like. How to free convert MKV to Samsung Galaxy Tab on Mac? This tutorial will show you tips and tricks in putting MKV to Samsung Galaxy Tab free on Mac, so that you can enjoy the video you desire on Samsung Galaxy Tab with ease. This guide shows you how to use the free video to Android phone converter to convert video to Galaxy S3, HTC ONE X, etc to enjoy video freely. Wanna enjoy your DVD movies on Galaxy S3? 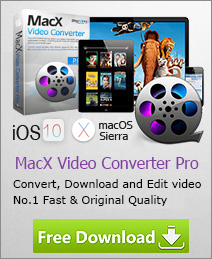 MacX DVD Ripper Pro is you best choice, helping you rip DVD to Galaxy S3 on Mac OS X. Hence, you can watch the DVD movie you like on Galaxy S III on the go.